I’m always intrigued by huge bases, typically a prolonged period of contraction leads to a prolonged period of expansion, hence the term; the bigger the base, the higher into space it goes. Buying stocks emerging from bases is by far my favorite set-up. $Z $PI and $WKHS are some of the ones we’ve highlighted in the last couple of months. $Z and $PI on 5/18/2017, Zillow has moved 24% since then and PI +50% since the POST. WorkHorse (WKHS) went up as much as 33% since this post on June 2nd, POST. They are not all winners, but it’s a high probability set-up. Stan Weinstein, the author of Secrets For Profiting in Bull and Bear Markets, describes the basing area as follow. PDLI BioPharma $PDLI and Vical Incorporated $VICL are two biotech stocks that are just emerging from long bases. 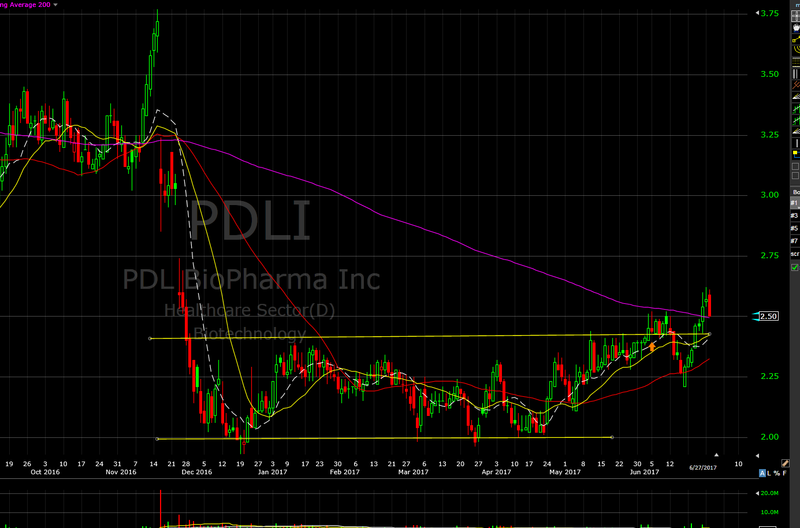 PDLI is emerging from a 7-month base and VICL from an 8-month base. If these stocks can manage to stay above the top of their respective ranges more gains are more than are likely to follow.